There are some top games on this weekend and we can't remember the spreads being so close. All the matches should be hotly contested, the top tier teams meeting, the bottom tier teams matching up. It's a quirk of the scheduling, and not the best outcome, but there are no Premier matches in Vancouver this weekend. Four on the Island and one in Seattle. There are other weeks when there are none on the Island and four in Vancouver. Share the joy BCRU scheduler! CW apparently getting some motivation from the "weakest lineup" comment came firing out of the blocks and were up 26-5 by the half. The match was all but over. Ravens scored first in the second half but CW added 12 more points to claim the win. CW remains undefeated in Premier play, they lost their first match to JBAA but that was a Barnard Cup fixture. Not sure what to think of Ravens after two defeats post CRCC title. They're 1-3 in league play and the prospect of them repeating this season as champions becomes less likely every week. CW have next week off while Ravens visit the Rowers. The undefeated CW team at home vs last years champions UBCOB Ravens. CW missing some key players however, the 7s duo of Pat Kay and Luke McCloskey not showing in the lineup. Josiah Morra out east with the Ontario Arrows. Isaac Kaay has moved to the Vikes. It may be their weakest lineup so far this season. The Ravens were flying high after the CRCC title but then they were shut down by the Thunderbirds last weekend. So which group of Ravens will CW see this week, one who sheds an unkindness on attack or one who on defence quotes "nevermore"? The Ravens are missing outside flyer Sean Ferguson from the starting XV but prop Chris Taylor is back in the starting rotation. 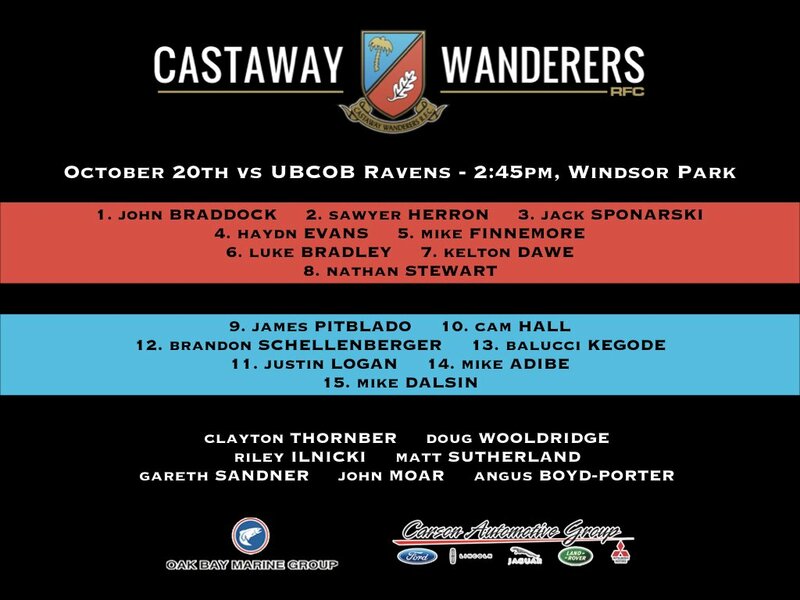 I have a feeling the Ravens will be wanting to prove a point after their loss to UBC, plus CW are missing a number of key players. Prediction: Ravens by 2. Well Nanaimo did keep Lomas under 30 but couldn't generate enough offence. Nanaimo the only team without a win so far this season but with a draw and 5 points they're tied in the cellar with Westshore and James Bay. Ravens, UVic and Lomas are only 2 points clear. UBC and CW look early bets for top 2 in the league. Nanaimo visits James Bay next weekend while Lomas travel to Burnaby. Two winless teams looking to notch their first points in the W column. Nanaimo with two big losses this season but a draw against a good Rowers squad. They have their star backline player back for the first time, Jared Stephens, he's starting on the bench but will have some impact when he comes in. They also have some recently arrived imports including Scottish #10 Stephen Gillies who has been getting good reviews. The Lomas have 2 bonus points in their 3 losses, they only lost to Seattle by 6 points. Going to be a tough game to call, Nanaimo have had defensive problems, it will be interesting to see if they've been able to address that. They've given up an astounding 60+ points on average in their two BC Premier matches. If they can keep Lomas to less than 30 they may have a chance. Prediction: Nanaimo by 1. A tough trip for the Bays, the tries came fast and furious but going the other way. It was 33-6 at HT and things didn't improve much in the second half. Seattle will be happy on their turnaround after fading last week against the Rowers while the Bays will be looking to get back on track at home against winless Nanaimo. Seattle have a bye next week. The Bays hardest hit by the Arrows game out east losing Matt Mullins and Moe Abdelmonen. Connor Braid and Jake Thiel unavailable, looks like the 7s players doing some brainstorming this weekend. Clayton Meeres injured after returning from the APC tournament in Uruguay. They do have Shea Wakefield back though, also a couple of players coming in, Alex Jordan we believe from Ontario and Bronkhorst from Alberta. Seattle missing the Suniula brothers but Alladin Schirmer back at #8. Seattle will be smarting from that comeback win by Rowers last weekend, the Bays missing quite a few from their narrow home win over Westshore. Prediction: Seattle by 3. UBC probably the top team in the league right now on current form, the CW v UBC match doesn't happen until February 2nd to decide that issue. They sit top of the standings but have played two more matches than CW at this point. The Vikes sit 1-3 but last year they came on strong in the second half. The bigger worry for them is facing the T-Birds again in the University Championships next month. Neither team showing up in the schedule next week. Always a top match, two of the on form teams right now. UBC are top of the standings, only loss was in Week 1, there's no way I'm betting against them this week even though they're on the road. UVic missing James O'Neill and Brennig Prevost, not sure if they're injured or being kept on ice by the centralized program. UBC missing Andrew Coe who is out east with the Arrows. The university championships coming up next month and likely these two will meet in the final again, this is the preview. UBC have had the upper hand lately. Prediction: UBC by 5. An entertaining match and the Westshore 50th anniversary went well as they won all three matches, two against Rowers and the women against Cowichan. The Rowers gave the home crowd a bit of worry near the end with their Seattle comeback reputation preceding them, they marched down the field putting together an impressive multi-phase attack that gobbled up the yards. One errant knock-on however put the heroics on hold for another week as the whistle blew and the home fans celebrated. The Rowers host the Ravens next week while Westshore have a bye. Westshore narrowly lost to a strong JBAA squad last week while Rowers had an amazing comeback win in Seattle. It's the Westshore 50th anniversary celebration with a skydiver delivering the game ball for the match. Should be a big crowd and give a little extra to the home field advantage. Both teams loaded up with import talent so it should be a good quality match. 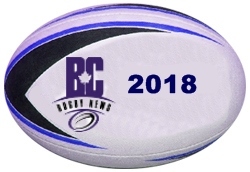 Quinn Ngawati released from the Toronto Wolfpack is suiting up in the centres for Westshore and along with kiwi Taylor McGuire provide a good centre pairing. The two opensides are top quality, James Kelly from Surrey with Rowers, and Cole Mosychuk from Burnaby with Westshore. #8 Ben Brill was the standout for Westshore last weekend. Should be a great rugby day. Feel the home turf will be the decider but never count out the Rowers. Prediction: Westshore by 3.